A Twin Towers Mattress Sale? Wow! What could go wrong with that? I know, it’s so tempting to do a commercial yourself. Why should you pay an overpriced ad agency with expensive writers and art directors and strategists and producers and planners and experience? Your daughter has more creative talent in her little finger than a whole skyscraper (oops, bad metaphor) liberal arts college full of so-called “experts”. What could possiblay go rong? It’s just a commercial, for crying out loud! And if something does go wrong–I don’t know–but just say somebody–I don’t know who, some tiny coven of “politically correct” wackos–could possibly be offended by an ad that was intended to be lighthearted as being tasteless; well, you can always quickly take down the ad and nobody’s the wiser. Right? Right? Sure you can. 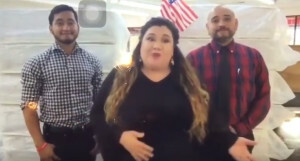 The poor company, Miracle Mattress, in San Antonio, has announced that due to the unexpected backlash of its “Twin Towers” (of mattresses, people! MATTRESSES!) 9/11 Day Sale ad, it has not only taken the ad off the air, it is closing its doors indefinitely. I feel so sorry for the owner’s daughter, who didn’t mean any harm and acted her heart out in this innocent commercial. She’s probably crying inconsolably. Can you imagine how she must feel? Still, use this as a cautionary tale. You may be tempted to DIY your own advertising campaign. And save big bucks. And it’s all mad fun …until someone loses an eye. Or a business. But have the professionals do it. Sure, we’re more expensive. But we don’t make business-killing mistakes like this. What? You want to see the commercial? You sicko! I’m not going to indulge that behavior. Google it yourself.